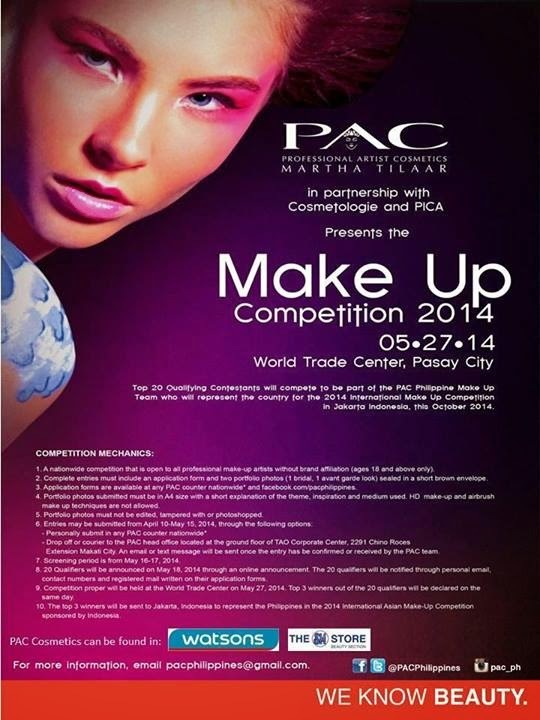 PAC Make Up Competition 2014 ~ Philippine Freebies, Promos, Contests and MORE! The Professional Artist Cosmetics, in partnership with Cosmetologie 2014, is calling all make-up artists to start submitting their entries for the PAC Make Up Competition 2014. Application form is available through PAC's FB page or you may get it at any PAC counter nationwide. 1 bridal and 1 avant garde look photos, along with your entry form, are required to complete your portfolio. Seal it in a short brown envelope and submit it at the PAC office or at any PAC counter nearest you. Twenty (20) qualifiers will move on to the competition proper in which three (3) top finalists will be chosen to take home a PAC Make Up Worth P26,000, receive an expense paid trip to Jakarta, Indonesia to compete in the International Make-Up Competition, and be the official PAC Philippine Representative to compete against all the best make-up artist in Asia. Portfolio photos must be in A4 size with a short explanation of the theme, inspiration and medium used.